Got any rivers, you think are uncrossable? Got any mountains you can’t tunnel through? He does the things others cannot do. As I have gotten older, I have been really interested in my genealogy. Even the Bible has a great Genealogy guideline. As I fill out my family tree, I have been reflecting more on my grandparents influence in my life. I would like to start this little series about my Poppy (Paul Lucas). My grandfather was born in 1924 in Oklahoma. He grew up in a small town and was very ornery! His father was a blacksmith, and his grandfather the Sheriff. I have many great memories of my Poppy and Granny. Poppy and Granny were always there to encourage me with my singing (Granny still does!). They took me, my brother, and my cousins to Youth Rally’s, Fellowship Meetings, District and General Conventions, and even to our National Teen Talent Expo in Florida. Poppy taught me how to drive, which I think he took many heart pills for! 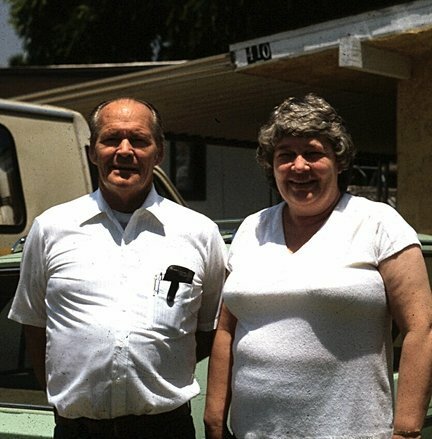 They were always an encouragement to all of their children and grandchildren, even when we were difficult. One thing that I remember most about my Poppy is his love for Jesus. He showed us grandkids the love of God. He was an example to his family by showing us how to be patient, kind, and still tell the truth, even if it hurts. Poppy and Granny always sang together when they were in the car. Poppy would always start Got Any Rivers?, and Granny would harmonize with him. Then Poppy would whistle the song and Granny would hum along. Even though I was a teenager and would roll my eyes at my cousins or brother when they would start singing this, the song has really stuck with me. I would even sing it under my breath at times. Poppy had a stroke in the winter of 1992. Even that didn’t stop him from doing God’s work. He witnessed to numerous people. He was even planning a new church if God healed him. He and Gran even sang Got Any Rivers? He never lost faith or went into a pity party about his condition. I spent the summer of 1994 with Poppy and Granny. During that time, I read a book about a boy who grew up when my Poppy did. As I would talk the little songs in the book, Poppy would start singing them. I had so much fun that summer. I learned about him and his childhood. It will always be a memory that could not be compared. It was then I truly started realizing the example he had on my life. This past October I went to visit my cousin Hollie, she brought out an old tape recording of my Poppy singing some of his songs to her oldest son, Travis, when he was a baby. For the first time in 15 years, I heard my Poppy’s voice. As I sat, listened, laughed, and cried, I watched my kids’ faces and seeing my son’s, Lucas, eyes light up at the funny songs, it made me a little sad that they never got to know him. However, there is a day, very soon I pray, that they will know each other and I know that he will give them the biggest hug in the whole world. It makes me happy to know that I am raising my kids to have the same type of faith and values that my Poppy and Granny have passed along. Yes, we are ornery at times; but, my kids know how much God loves them and that He has a plan for their lives. Do you have a person who is an example of Christ in your life? If so, and you get a chance; tell that person how much they mean in your life. Let them know you appreciate the Godly example they have made in your walk with God.